By now, 5 million users have downloaded Skype 2.0 from the iTunes Store. (Mashable) -- On Sunday, Skype 2.0 was launched for the iPhone 3G, bringing a long-sought feature to the table: making calls over 3G. By now, 5 million users have downloaded the application from the iTunes Store, showing just how important this feature is to users. Unfortunately, the new feature was accompanied by an unpleasant announcement; after August 2010, Skype will start charging a monthly fee for the 3G calling feature on top of whatever fee you're already paying your mobile operator for data transfer. Skype promises the fee will be reasonable. "We're not going to want to price ourselves out of the market. 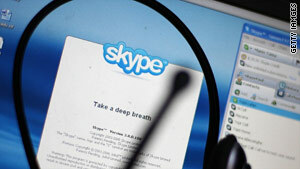 I can't ignore the fact that consumers (currently) use us for free," said Russ Shaw, Skype's general manager for mobile. Still, one cannot help but wonder how the users will react when faced with a double fee for mobile VoIP calls. How do you feel about it? Will you continue using Skype over 3G after the fee is introduced?